This home is perfect for a couple, small family or guys getaway. Featuring one master bedroom upstairs with an attached full bathroom. On the main floor is the kitchen with just about everything you would need to have a nice meal at home, a half bath and dining table for four. There is a living room seating area with a futon that converts to a bed in minutes. The home is set with WiFi, as well as a TV with a internet ROKU box. Sorry no cable. Above the seating area is a loft for sleeping, perfect for the kids. This is a very cozy home that has just enough trees to keep it shaded and cool inside for those hot McCall summer days. Just minutes away are all the amenities that McCall has to offer- a 2 minute walk across the street and you are at Davis Beach on Payette Lake. 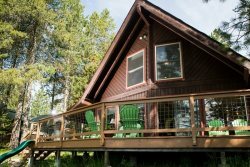 The house is located at the entrance to Ponderosa State Park and a few minutes walk from McCall Municipal Golf Course. Jug Mountain Golf Course, Tamarack Golf Course,Manchester Ice Rink, McCall Airport and beautiful downtown McCall all await you. Nearby activities include boating, jet skiing, swimming, fishing, hiking, golfing, bike riding, and shopping just to name a few! We are on McCall’s free bus route. All you have to do is stand on the street and wave them down at 35 min. past the hour. The driver will give you a map to let you know where to catch the bus to get back home. Or enjoy a leisurely 15 minute walk or bike ride to town. This property makes a perfect gathering place for recreation and relaxation. It is conveniently located to unlimited amenities.